Lingua Custodia is now moving to the next step of development. We are happy to welcome Franck Burlot, PhD. as Head of R&D and Stéphanie Mogenot as Chief Marketing Officer to the Management Team. Franck’s responsibilities are to contribute to key strategic initiatives and lead the Research & Development Program, from structuration to implementation. He has been working as a researcher for 10 years and has focused on Machine Translation Advanced technologies for the last 5 years. He previously worked as a Research Associate at the LIMSI-CNRS, was Teaching Assistant in Natural Language Processing and a Project Manager in Neural Machine Translation. 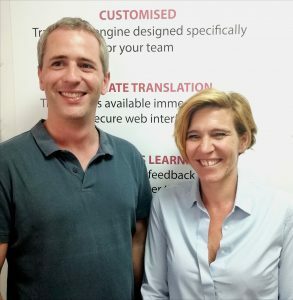 Franck holds a PhD in Linguistics from Université Paris-Sorbonne and two Master’s Degrees in Natural Language Processing and in Linguistics. He speaks 5 languages. Stephanie’s responsibilities are to contribute to key strategic initiatives and provide key marketing and support for Lingua Custodia’s business development programme. She has been working in asset management for 17 years, with a range of roles in the domains of Project management, Communications and Marketing. She left the corporate world as Global Head of Marketing and Communications at AXA Real Assets in order to focus on personal entrepreneurship. She founded a consulting agency in Marketing and Communications targeted to neo entrepreneurs. Stephanie is graduated from Paris University with a Master’s Degree in Bank, Finance & Risk Management and has completed a Woman Entrepreneurship course at ESSEC Executive Education.